Is this a sign, that hunters will get cheap damaging spells next expansion? If yes, then I can definitely see some face hunters running this, in order to inflict the last bit of damage to finish off the opponent. Though I can't deny that this is a very slow card and the weapon is vulnerable to oozes. Another usage of this card would be in combination with AoE spells, but come on, as if hunters will get those. Turn 8 - Any two drop or less beast, weapon attack, arcane shot, arcane shot, kill command, kill command for 24 damage burst. It all depends on what we get because I don't think there isn't a lot of support to make her work right now. Seems like a fun card, and a turn 10 Kill Command with a Beast already on board is alot of damage. 3 mana do 7 damage, plus the weapon is another 2. Will Zul'jin get the Spell Damage after attacking with it, then playing the hero? Too expensive imo, which makes it bad. But if there are more cheap spells aside from Wing Blast and Kill Command, than maybe, as a finisher or something?! 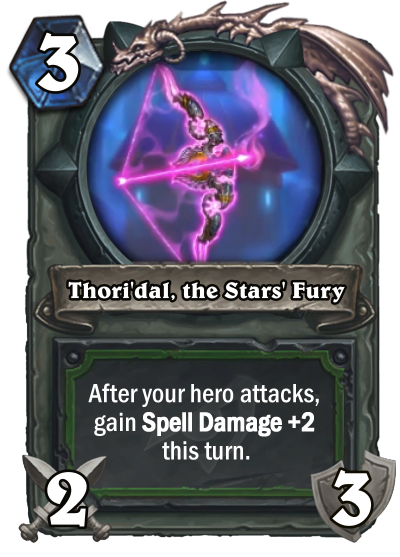 I don't really know, but I am not impressed with this card and the effect on the weapon. Great tempo card, similar to Malkorok and having +2 Spell Damage for 3 turns is a great upside. So yes okay I cant think why Hunter would work with Spell Damage synergy ( I cant think of any cards that will have seriously better impact with it ) but overall statwise is a ok card without the effect 7 mana 5 6( 5 6 body is like 6 mana) and you get a 2 3 weapon with it, so not a useless card. It is obvious that this card will see some support this expansion, maybe it will be for midrange hunter ? Why i cant see the card whenever it get posted for like 30 mins? im on mobile, is that it? Seems average, not game breakingly good, but reasonable. With Kathrena and Rhok'delar rotating, this might see some play. This is going to be a very fun card in a spell hunter deck. Attack with weapon and then play zul'jin as potential rng finisher. Plus maybe hunter will get some more spells that only target enemies. This card can be good, but needs some obvious support as for this moment. The art for the bow is awful, but otherwise an interesting card. Well at least some hunters will play Bomb Toss and Arcane Shot on first week. Will be fun to fight against these hunters at least. 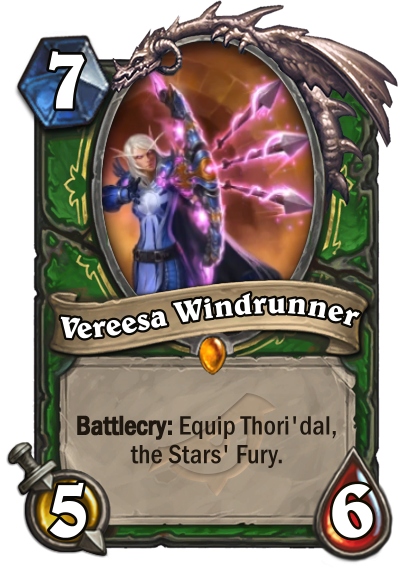 Just the fact that it is Vereesa has me hyped for this card. And the effect is unique for sure. I cant wait to craft this golden.